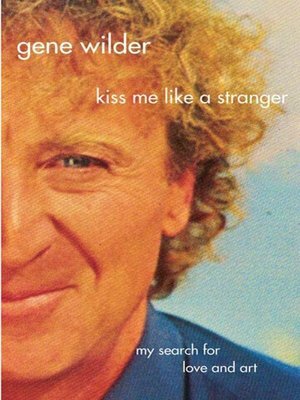 In this personal book from the star of many beloved and classic film comedies — from The Producers to Young Frankenstein, Blazing saddles to Willy Wonka and the Chocolate Factory — Gene Wilder writes about a side of his life the public hasn't seen on the screen. Kiss Me Like a Stranger is not an autobiography in the usual sense of the word, and it's certainly not another celebrity "tell-all." Instead, Wilder has chosen to write about resonant moments in his life, events that led him to an understanding of the art of acting, and — more important — to an understanding of how to give love to and receive love from a woman. Wilder writes compellingly about the creative process on stage and screen, and divulges moments from life on the sets of some of the most iconic movies of our time. In this book, he talks about everything from his experiences in psychoanalysis to why he got into acting and later comedy (his first goal was to be a Shakespearean actor), and how a Midwestern childhood with a sick mother changed him. Wilder explains why he became an actor and writer, and about the funny, wonderful movies he made with Mel Brooks, Woody Allen, Richard Pryor, and Harrison Ford, among many others. He candidly reveals his failures in love, and writes about the overwhelming experience of marrying comedienne Gilda Radner, as well as what finally had to happen for him to make a true and lasting commitment to another woman. A thoughtful, revealing, and winsome book about life, love, and the creative process, the New York Times bestseller Kiss Me Like A Stranger is one actor's life in his own words.